This worksheet helps students to explore different characteristics of human beings - in other words to see the extent to which we vary from each other. Variation is how similar or different living things are from each other. For example: in a class of students, some may be tall or short and have different coloured eyes, skin, hair. These are generally inherited characteristics (unless you've been having fun with hair dyes! 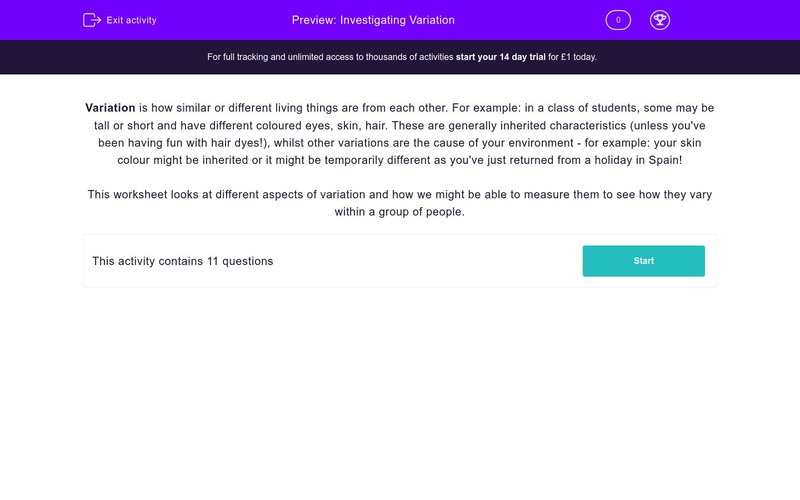 ), whilst other variations are the cause of your environment - for example: your skin colour might be inherited or it might be temporarily different as you've just returned from a holiday in Spain! This worksheet looks at different aspects of variation and how we might be able to measure them to see how they vary within a group of people. John and Sarah were investigating how pupils in their class were the same and different. First they measured the length of each pupil’s little finger. What would be the best instrument for measuring the length of their little fingers? Once John and Sarah had collected all the data for the length of the students' little fingers they plotted it on a bar graph. What do you think would be the most suitable unit for the measurement of their little fingers? Use the data in the bar graph to work out how many students are in the class. What are the most common (the MODE) lengths of little finger in the class (tick all you think are correct)? 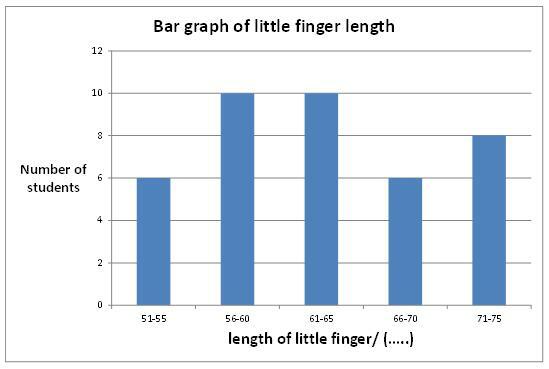 What do you think is the most likely reason for the variation in the lengths of the little fingers of the students in this class? John and Sarah had found out quite a lot about variation in their class. What do you think was the likely method that they used to collect their data? Looking at their data what proportion of the class would you say are able to roll their tongues? John and Sarah then continued their investigation by visiting a class of older students to see how they varied. First they measured the length of their little fingers. What do you predict John and Sarah are likely to have discovered compared to their results from the younger class? If John and Sarah now investigated the ability of the older students to roll their tongues, predict what you think their results are likely to be. Variations between people may be a product of their genes - something they inherited from their parents - or it may be a product of their environment. Here is a list of common factors that vary between people. Try to match them to their likely cause: INHERITED or ENVIRONMENT. If you cannot see all the words in the boxes on the left, just hover your mouse over them. A metre rule is too cumbersome to use to measure a little finger, as it is obviously a metre long! So a tape measure would work best, being easy to handle and flexible. Looking at the figures above and the likely length of your little finger it's got to be mm (millimetres). I mean, a 50cm little finger? That's half a metre long...! Look at the height of each bar next to the number of students: they go 6, 10, 10, 6, 8 - that's how many are in each group. Add them up to make 40 students. As you can see there were two groups each with 10 students in: 56-60mm and 61-65mm - these were the most common lengths of little finger. 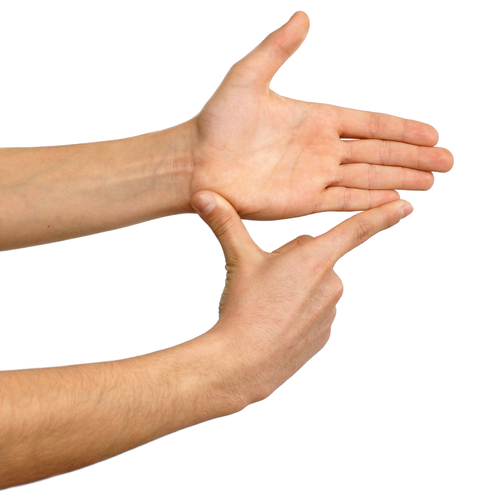 It's true that what you eat does have an effect upon how well you grow but the key reason for the variation here is inherited characteristics from our parents: it's likely that parents with longer than average fingers will produce children with longer fingers as well. Tongue rolling is an observed factor - you either can or you cannot. So John and Sarah would ask their classmates to roll their tongue and simply note how many could and how many could not. If you add 34 to 6 you'll see that John and Sarah measured the tongue-rolling ability of 40 students. If 34 of those 40 students can roll their tongues, that's 85% ((34 ÷ 40) x 100 = 85%). Clearly, as you grow, your fingers grow too. 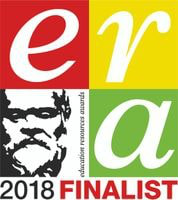 So whilst in the older class there will be students with little fingers no bigger than those in the younger class, looking at all the data it is likely that the spread of results would be bigger, say from 50-75mm in John and Sarah's class up to 65-100mm in the older class. 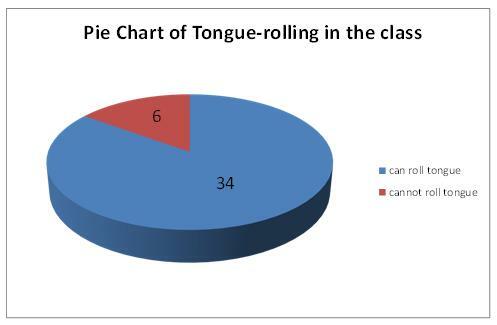 Although it's unlikely to be exact, the PROPORTION of the students who can roll their tongues in the older class is likely to be very similar to those who were able to in the younger class. That's because it's a TRAIT that you inherit from your parents: either you can or you can't. It does NOT change with age like, for example, the length of your little finger would do. So about 80% should be right. All right, hair colour can be changed with dyes (environmental) but we are all born with a particular colour BEFORE we change it! Also height can be affected by poor nutrition: a child who receives a poor, unbalanced diet and not a lot of it is less likely to achieve the full height that their genes could have allowed them. However, taller people are much more likely to have tall children. If you are a rugby player, the shape of your ears may change slightly, but the original ear shape is inherited in your genes. Otherwise you can see that some are clearly the product of where we are and what we do - others are the product of what information we inherited from our parents' genes.